Dressing up denim has become my go-to style this fall. 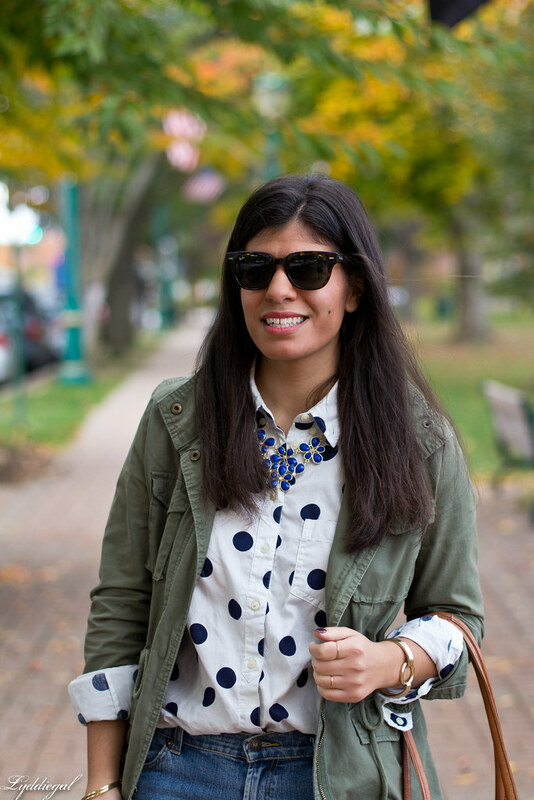 I love a great button down, and it's always fun to slip a statement necklace under the collar. This bright blue floral necklace is a fun piece to layer, and it's super affordable as well, it's part of the Apt. 9 line at Kohl's. I love that blouse paired with those jeans - it definitely dresses up the denim! 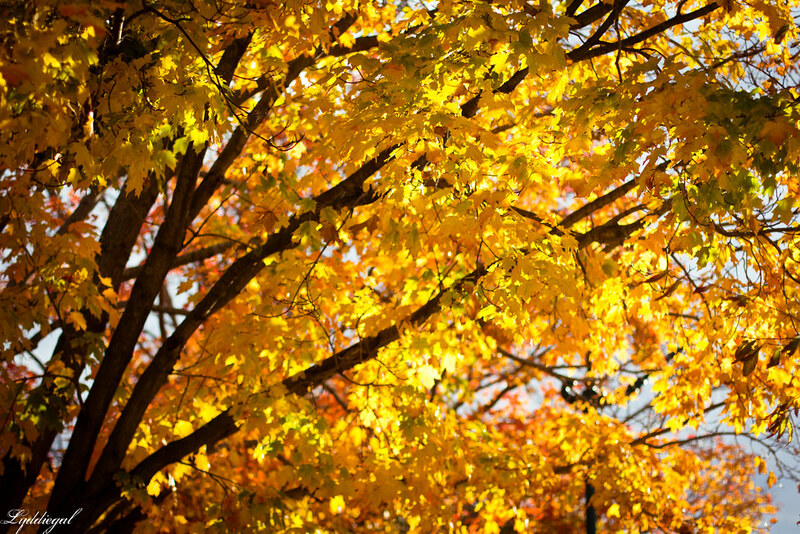 What a perfect fall uniform:) Love. Have a great day, sweetie. This is darling! Your bracelet is so cute and pulls everything together perfectly! I love the size of the dots on your shirt! So gorgeous paired with that jacket! I didn't used to wear that many button-downs, but sometime over the past couple of years, I acquired a few that I wear all the time. 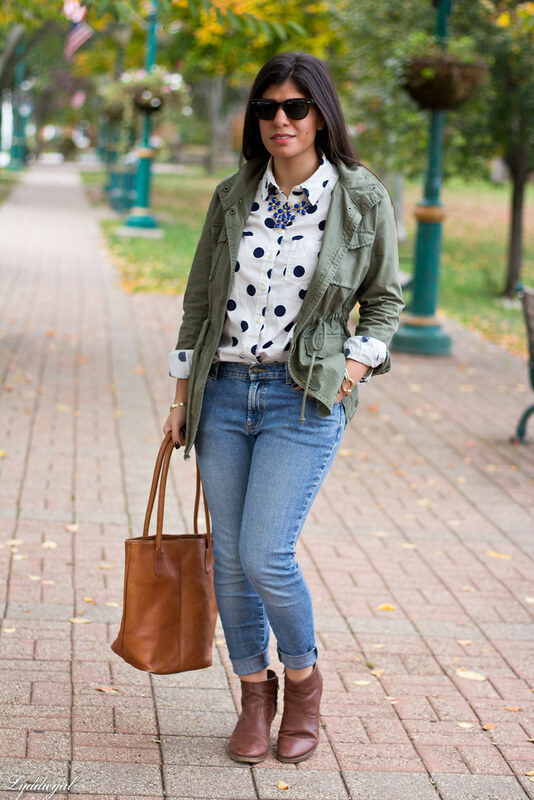 I love your dotted shirt paired with the army green jacket! That top is so perfect, I love it. Great pairing, I love the navy brown and olive mixing! I love your military jacket with your polka dot top. So perfect! I love that polka dot top. Love the outfit! Everything about it is so perfect! I like the polka dots and utility jacket together! A wonderful, casual-chic look! This shirt is so pretty, I love how big the dots are. I agree! I have a ton of button ups. 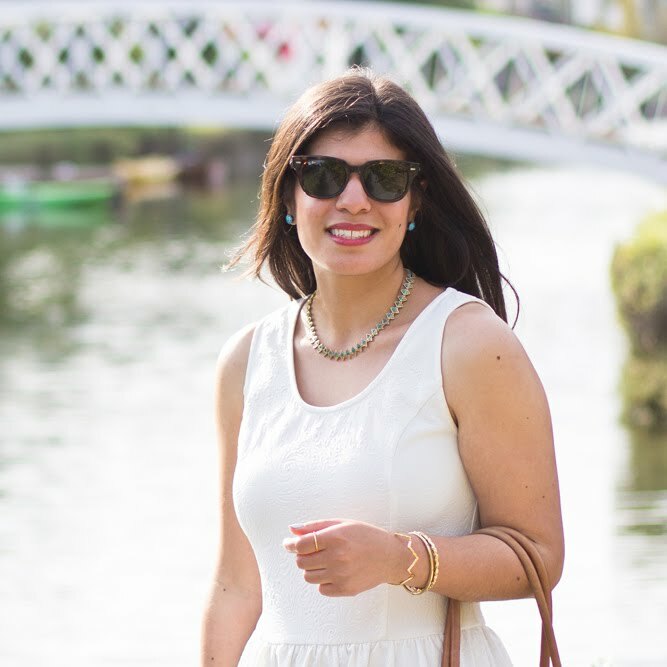 Adding jeans and a statement necklace is something I wear a lot! This is such a fun look! 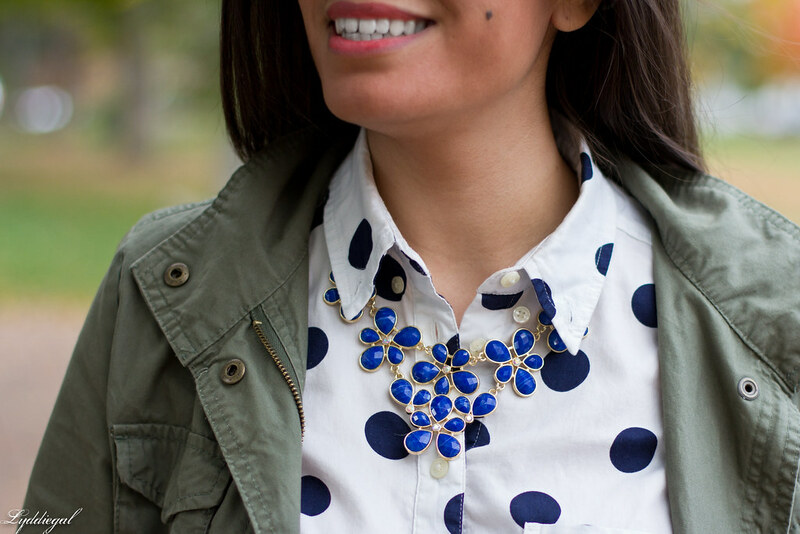 I love the polka dots mixed with the blue necklace. Denim is my favorite, dressed up or down. I'm with you on dressing up denim being my go to this season!! 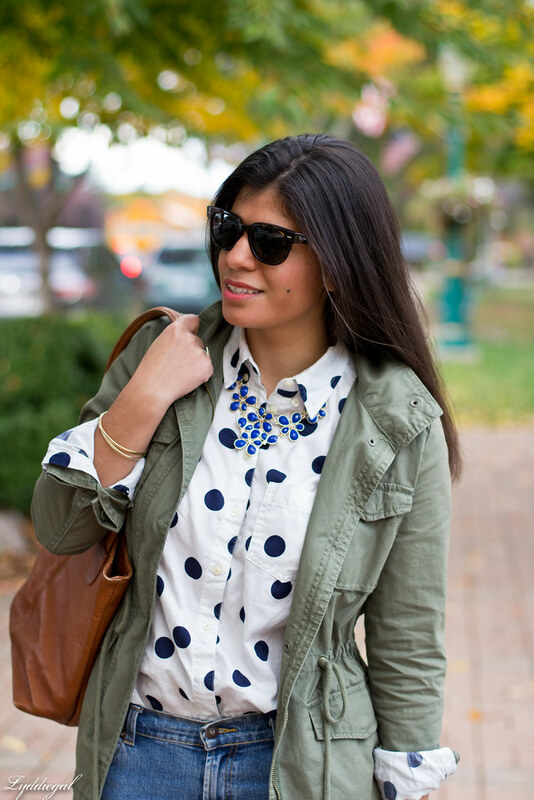 Love how you styled yours, the polka dots and blue necklace are so cute together! Hi Lydia! The necklace is beautiful! That surely adds a touch of elegance to your outfit! I love it! Such a cute look - I love your blouse! I really love this polka dot shirt, it looks great with the denim. Your accessories as usual are a great pairing! I love the scale of the dots on this blouse; it's really, really great! I love this classic look. 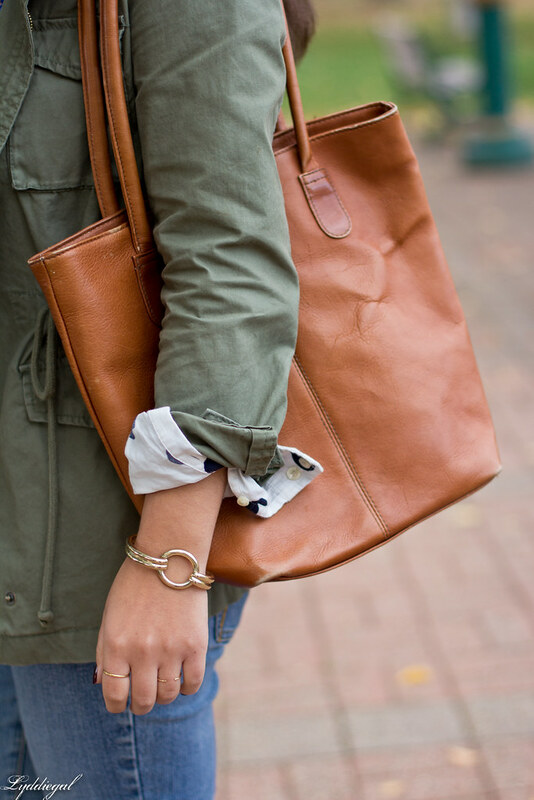 The utility jacket is perfect with the feminine blouse and necklace! I had a similar utility jacket in my hand recently … i kept trying to find the right one.. but i'm still on the hunt. Great look! that utility jacket looks perfect over the polka dots shirt! You dressed up your denim to perfection. 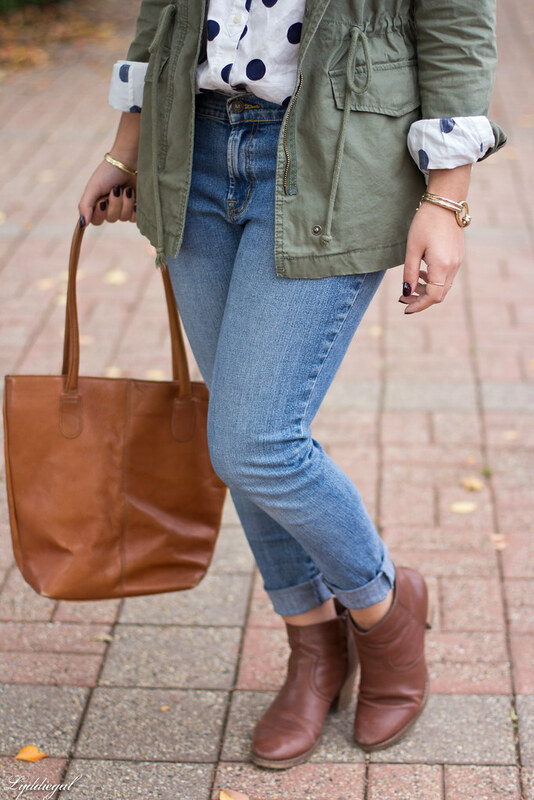 Perfect fall layers, I love the look of the utility jacket with this.